AT THE ANGELS IN THE ATTIC STORE FIND YOUR HALLOWEEN COSTUMES. MUGS AND GLASSES ARE A QUARTER. FALL AND WINTER COATS AND JACKETS NOW ON DISPLAY. DECORATE YOUR HOME WITH PAINTINGS OR POSTERS. NEED SCRUBS? GLASSWARE. Halloween costumes are now on display at The Attic. (When these are sold, there will be more from our back room.) As you enter The Attic, there is a hanging rack of $2.00 costumes. In addition, you will find boxes of accessories: Halloween buckets are 25¢, masks, 50¢, wigs, 25¢, capes, 25¢, hats, 50¢, and even tutus,50¢. For working folks, a new selection of scrubs has come in. They are always $1.00. Decorating your home? We have a selection of framed pictures, paintings, photos, and posters, scattered throughout the store. Look up on the walls. Prices vary. Winter coats, jackets, and boots are now for sale at The Attic. Adult jackets with linings are generally $3.50, coats are $5.00, and boots, $3.00. Children’s clothing is less. Check the prices posted throughout the store. CD’s are still 2 for 50¢. What a deal! We have glassware of all types, 25¢ unless marked otherwise. There are tumblers for milk and iced tea, juice glasses, footed dessert dishes, small and large glass mugs with handles, wine glasses, and champagne flutes. We also have many 25¢ ceramic coffee mugs. Don’t forget the sidewalk sale at the Boutique on October 13. The Christmas Store will open October 16. 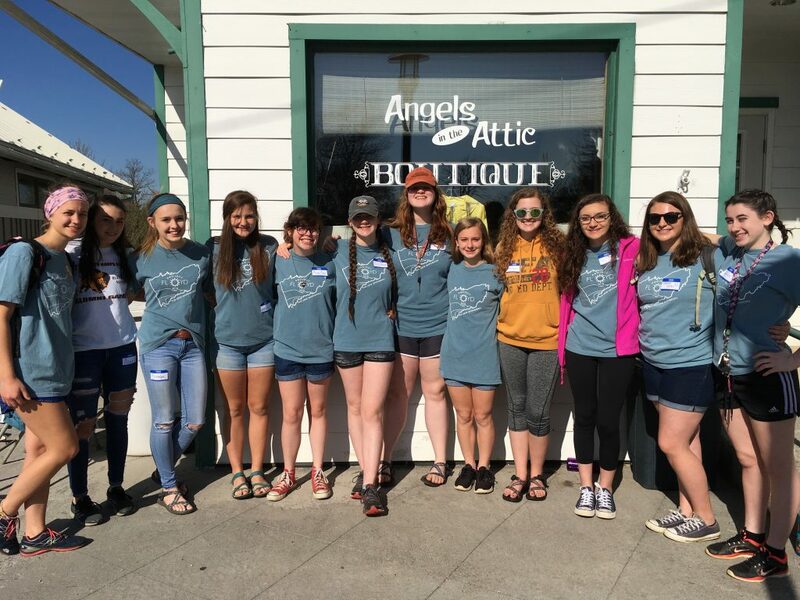 The ladies in the photo below are volunteers from Floyd County Young Life who worked on the Angels Boutique and the Angels in the Attic Store to improve the customer experience. They did a great job, and many thanks to them.